I started running again this June. I decided it was time to work in fitness for my body. Training to get better for something on my bucket list. Turns out this is also good fitness for my brain. It gives me time to think about what I am doing and learning. I think on upcoming assignments and potential blog posts. I lose myself in the run and lose my brain in my thoughts. Its been a good move on my part. 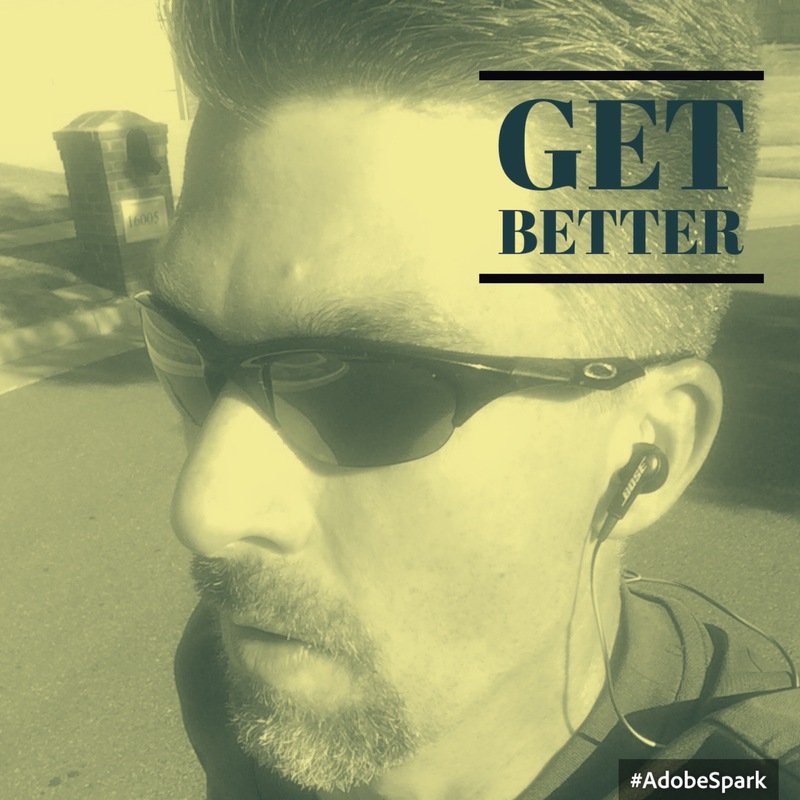 Recently I started thinking on my relatively short journey into running and how it relates to teaching. Here is my first run, on the last day of May, as posted to my personal Twitter. Not very fast, but it is a start. And over the next few weeks, I ran at least four times each week. By the end of June, I attempted a two mile “sprint” to see what my times would be. And my mile splits were better: 8:28 for mile one and 9:00 for mile two. I was gassed and had to walk home, somewhat disappointed that I could not finish the circuit. Today I ran another two mile “sprint” and my times were better: 7:28 for mile one and 7:41 for mile two and I did complete my circuit. So what does this mean? It means that over the summer, with regular training, on my test day – I lowered my time by one minute on the first mile and by over a minute on mile two. Regular training. 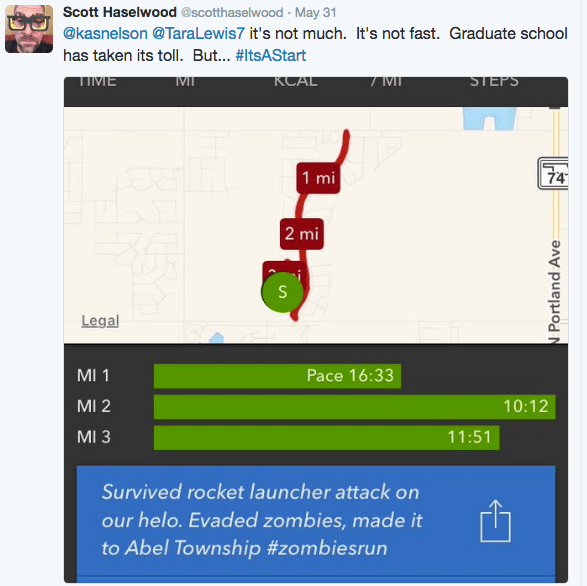 And – I gamfiy my run with the Zombies, Run and Fitbit apps. I almost look forward to it…almost. 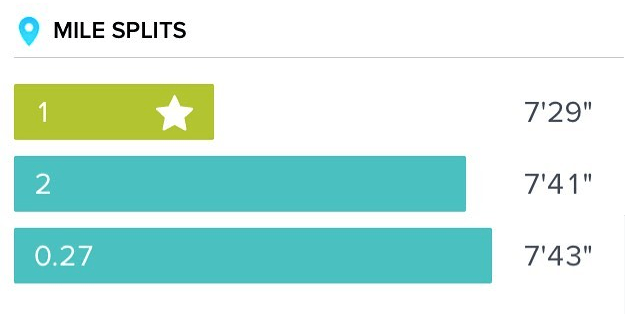 Mile splits on my 2-Mile test day. July 23. Here is the connection to teaching: it takes some regular training and practice to increase your performance. Most teachers know this. What we forget is this: we can do cool new things in our classrooms if we will take the time to try them out! I am not a natural runner. Running is hard for me. So was the first class that I flipped! Man was that tough. But I kept practicing the flipped classroom. I would read what other teachers had done on the flipped classroom. I reflected on what I was doing and trying to accomplish in the flipped classroom. And I got better at managing a flipped classroom. It didn’t happen over night or even in one year. It was a journey. I had the same experience with gamification. I tried something new in my calculus classroom when I gamfied it. This was different than anything that I had ever done before. I had read about gamification. Went to conferences. There was an idea of what it looked like in my mind. I needed to start gamifying things so I could practice it. Work on it. Improve it. Then my journey changed course. I do not consider myself a very good writer, math comes to me way easier than the words and the grammar. However, the writing that is required to successfully navigate a phd program has given me more confidence with my writing. I have had to write, and write, and write some more. And with all of that practice and feedback and work and reading writing from other people, my writing has improved. Don’t believe me? Read some of my posts from 2014, I feel like I’ve gotten better. Regular Practice. What do you want to do better? Is there a classroom innovation or technique you considered trying out, but haven’t yet? What deliberate risk can you take with your practice? Try flipping a class. Gamify your PD. Focus your class on student creation. Find and use educational technology. Just get started. Somewhere. Anywhere. Then practice that thing. Work on that thing. Get better on that thing. It may not go smoothly on that first try. However, it is a start. My first run was frustrating for me. My expectations were so much higher than what I could physically do. But I kept working at it, and that work has payed off. I had similar frustrations with flipped class and gamification. But hard work, practice, testing myself. These things helped. I got better. I gained confidence. It changed my teaching practice.